Roofglaze’s range of Flatglass rooflights are ideal for adding natural daylight, and ultimately value, to residential projects of all shapes and sizes. We offer a range of off-the-shelf stock Flatglass rooflights that can be ordered through our Online Shop. Sometimes, however, the project requirements dictate that a bespoke rooflight solution has to be created, which is something that we specialise in at Roofglaze. Previously, the site at 60 St Thomas Street in Wells had been a public house, with the ground to the rear of the plot used as the car park for its customers. The original house was a listed building and within the Wells conservation area, with the client’s dream to build a contemporary and energy-efficient new house, making the most of the picturesque views to the South-West of Glastonbury Tor and Wells Cathedral. With this in mind, the living space was created by making the best possible use of the whole site, with 1m thick walls on two sides and the site boundary on the other two. The areas within the living space have been articulated, but not completely separated, so as to retain the sense of an expansive space. This is topped off by the 5m wide opening glass wall that connects the house to its garden area. 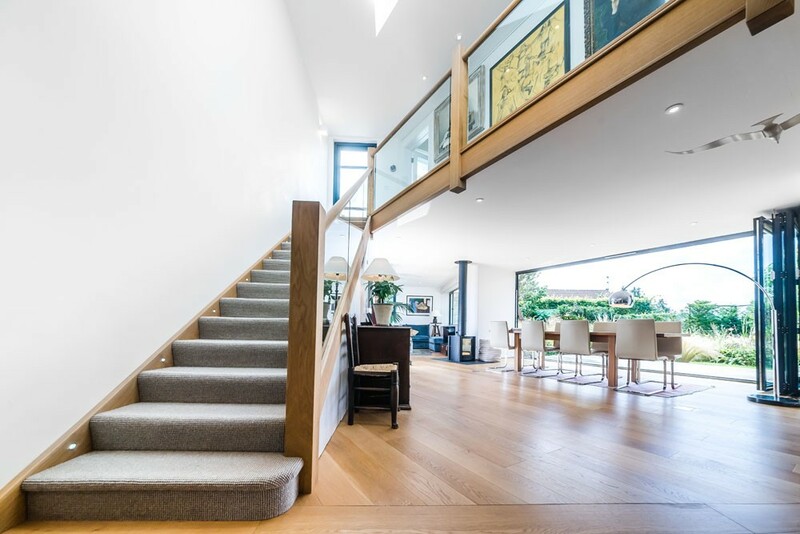 Batterham Matthews Architects expertly tailored the design of this new property to the client’s specific needs, enabling them to work from home most of the time and creating a life-work balance that is significantly more sustainable than it was for the client previously. This house has deliberately been orientated to face South to maximise the potential solar gain for the PV panels on the roof of the property, with an overhanging roof to protect the space from over-heating in the summer. Daylighting factors of 8% to all main spaces throughout the building minimise the use of artificial lights. It was therefore crucial here to select a rooflight system that has impressive U-values and G-values as standard. This is where the bespoke triangular Flatglass rooflight from Roofglaze came in, which was specified with a Low-E coating to further enhance its already strong technical performance. 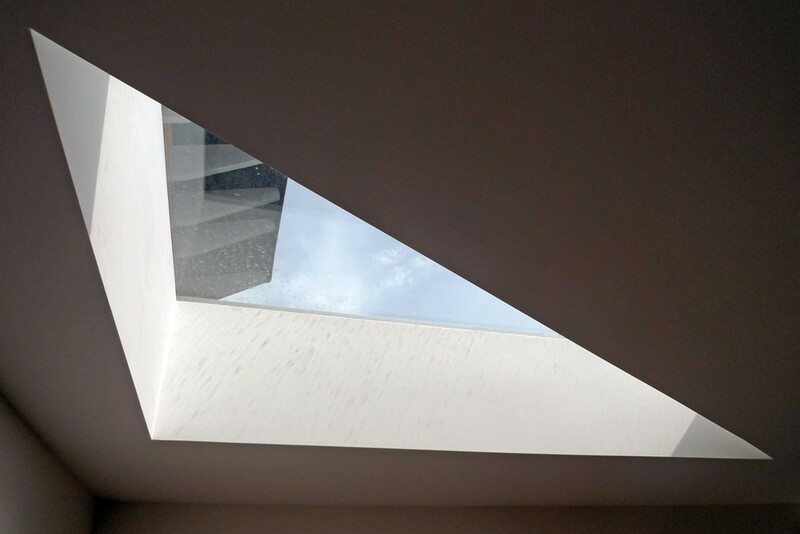 The images in this article, as well as the project case study, shows just how much natural daylight is brought into the living space by this bespoke triangular Flatglass rooflight. Also in this case study the client states that this rooflight was their ‘best buy’, which is always great feedback to hear, especially on an award-winning project such as this one! For more information and advice regarding the Flatglass rooflight range, then please do feel free to contact us with your inquiry.